Editor’s Note: This page has been updated for academic year 2018-2019. There can be last-minute changes, so readers should check honors websites to verify that the dates below. Below is a list of application deadlines for 80 public university honors colleges and programs. Please note that some deadlines are fast-approaching, while a few are as late as the Spring and Summer of 2019. If the deadlines are separated into categories (early action, early decision, regular deadline, priority deadline, etc. ), we will list the deadlines for each category. Alabama Honors: For University Fellows applications, the deadline is December 15, 2018; for other applications there is “no formal deadline,” but for housing and orientation purposes, the earlier the better. Arizona Honors : Priority deadline is December 2, 2018, with notification the wek of January 21, 2019. Essay required. Arizona State Honors (Barrett): Early action deadline- November 1, 2018 (notification December 19); regular deadline- January 6, 2019 (notification February 22); Late consideration I, February 24, 2019 (notification April 5); Late consideration II, March 31, 2019 (notification May 10). Arkansas Honors: November 1, 2018 for priority application; for scholarships, priority deadline is November 15, 2018; for financial aid, priority deadline is January 1, 2019, and final deadline is February 1, 2019; final Fall application deadline is August 1, 2019, but this might be too late for honors college. Auburn Honors: January 16, 2019. Binghamton Honors: Priority deadline and common app by November 1, 2018; all application materials by December 1, 2018; priority decision by January 15, 2019. Regular deadline January 15, 2019 (notification April 1, 2019). Central Florida Honors: Priority deadline, postmarked application by January 15, 2019; March 31, 2019, postmark for regular deadline. Cincinnati Honors: December 1, 2018, for honors and for scholarships. Clemson Honors (Calhoun): Priority honors deadline December 1, 2018, with notification February 15, 2019; regular deadline March 1, 2019; after meeting university deadline of February 15, 2019; notification April 1, 2019. Colorado State Honors: The Honors application date is February 1. In some cases, we may ask for additional information (such as fall grades) before making a final decision. After the deadline has passed, qualified students may be placed on a waiting list if the program is at capacity. Connecticut Honors: For merit and honors consideration, December 1, 2018. CUNY Macaulay Honors: December 1, 2018. Delaware Honors: Deadline January 15, 2019, including honors essay; (notification mid-March 2019). Florida Honors: (Freshman Honors): March 1, 2019; notification April 1, 2019; must accept by May 1, 2019. Florida Atlantic (Wilkes Honors):To be considered for prestigious WHC scholarships (e.g., Flagler), early application is encouraged. The deadline for applications is May 1 for upcoming academic year. Application via the Common App is recommended. Florida International Honors: Applications are open October 1st –May 1st every year. The priority consideration deadline is January 15. Transfer students who wish to compete for limited scholarships should apply by the priority deadline date. Florida State Honors: For presidential scholarship, honors medical, or honors legal, deadline is November 1, 2018. Honors application deadline is February 14, 2019. Georgia State Honors: Early action deadline is November 15, 2018; regular action deadline is March 1, 2019. Georgia Honors: December 1, 2018 to January 15, 2019. Houston Honors: November 15, 2018, for priority consideration; final deadline April 1, 2019. Illinois Honors (CHP): Early action deadline November 1, 2018, preferably earlier; final deadline January 5, 2019. Illinois Chicago Honors: Priority, December 1, 2018; regular decision, February 1, 2019. Illinois State Honors: See website. Indiana Honors (Hutton): Deadline for Hutton scholarships November 1, 2018. Iowa Honors: First deadline November 15, 2018, with notification February 1, 2019; final deadline, February 1, 2019, and notification April 1, 2019. Iowa State Honors: April 1, 2019, but prefers earlier applications. Kansas Honors: November 1, 2018, for admission and scholarships. Kansas State Honors: No specific deadline, but admission may be limited to space available. Kentucky Honors: December 1, 2018, but prefers earlier. LSU Honors (Ogden): November 15, 2018; notification on a rolling basis. Macaulay Honors CUNY: December 1, 2018, including essays. Maine Honors: Early action is December 1, 2018; regular decision (recommended) is February 1, 2019. Maryland Honors: Must apply by November 1, 2018, the university preferred deadline. Massachusetts Honors (Amherst): Early action November 5, 2018, credentials by November 20; regular deadline January 15, 2019, credentials by February 1, 2019. No separate honors application. Michigan Honors: Apply to university first, then send honors essay; university early action deadline November 1, 2018 (notification late December); regular deadline for failed early action and others is February 1, 2019 (notification mid-April 2019). Michigan State Honors: March 1, 2019, but “reserves the right” to cut off admissions at an earlier date. Minnesota Honors: Priority application deadline November 1, 2018; regular deadline January 1, 2019; all invited only after university acceptance on space-available basis only. No separate honors application. Mississippi Honors (SMBHC): Early action November 1, 2018, notification December 20, 2018; regular deadline is January 5, 2019, notification by early March 2019. Mississippi State Honors: December 1, 2018, preferably earlier; after that date, space available basis. Missouri Honors: The university scholarship deadline is December 1, 2018. Final deadline March 1, 2019. Nebraska Honors: The Fall priority deadline is October 15, 2018; final deadline is February 15, 2019. New Jersey Inst of Technology Honors (Dorman): February 1, 2019. New Hampshire Honors: Early action is November 15, 2018. Regular decision February 1, 2019. No separate honors application. New Mexico Honors: May 1, 2019. North Carolina Honors: Must be accepted by university first, followed by honors invitation. University early action deadline is October 15, 2019, with decision by late January 2019. Regular deadline is January 15, 2019, with notification in late March. NC State Honors: Must apply by early action deadline of October 15, 2018, and be admitted to university in order to apply to honors. Ohio University Honors: December 1, 2018. Ohio State Honors: Test scores, letters of recommendation, etc., by November 1, 2018. Oklahoma Honors: University scholarship deadline is December 15, 2018. Final deadline is February 1, 2019. No separate deadline for honors college. Oklahoma State Honors: Deadline for many scholarships is November 1, 2018. Final deadline is February 1, 2019. Oregon Honors (Clark): Early action deadline November 1, 2018, with all materials due November 7, 2018; notification December 15, 2018. Regular deadline January 15, 2019, with all materials due February 1, 2018; notification April 1, 2018. Oregon State Honors: February 1, 2019. Penn State Honors (Schreyer): (Schreyer): Priority deadline November 1, 2018, allows for interviews by end of January, 2019; final deadline December 3, 2018; notification by late February, 2019. Pitt Honors: “We operate on a rolling admission policy and although there is no specific deadline to apply for admission, it is to your advantage to plan ahead and apply early.” The priority deadline for scholarships is December 15, 2018. Purdue Honors: Priority deadline is November 1, 2018, for admission and scholarships. Rhode Island Honors: Early action deadline is December 1, 2018; regular deadline is February 1, 2019. Rutgers Honors (Honors College): December 1, 2018. San Diego State Honors (Weber): Preferred deadline is January 15, 2019. South Carolina Honors: Preferred deadline for scholarships and honors college admission is October 15, 2018. Test score assignment to university and letters of recommendation, November 15, 2018. First round of notifications in late December, 2018. Final notification in mid-February, 2019. South Florida Honors: Preferred, November 1, 2018. Priority, January 1, 2019. Final deadline, March 1, 2019. Stony Brook Honors: Priority deadline January 15, 2019. Temple Honors: Early action deadline November 1, 2018; university deadline is February 1, 2019. No separate honors application, and honors notification is within four weeks of university acceptance. Tennessee Honors (CHP): November 1, 2018, in order to be eligible for major scholarships. Texas A&M Honors: Application period begins July 1, 2018, and ends on December 15, 2018. Texas Tech Honors: Application period begins July 1, 2018, and ends March 1, 2019. UC Davis Honors: Application period for all UC campuses is August 1-November 30, 2018. Honors invitation after applicants confirm UC Davis as choice on May 1, 2019. UC Irvine Honors (CHP): Application period for all UC campuses is August 1-November 30, 2018. Honors invitation after applicants confirm UC Irvine as choice on May 1, 2019. UCLA Honors: Application period for all UC campuses is August 1-November 30, 2018. Honors invitation after applicants confirm UCLA as choice on May 1, 2019. UC Santa Barbara Honors: Application period for all UC campuses is August 1-November 30, 2018. Honors invitation after applicants confirm UCSB as choice on May 1, 2019. University at Albany Honors: Early action November 1, 2018; regular decision February 1, 2019. Univ at Buffalo (SUNY) Honors: Early action by November 15, 2018, to university and provide all test results and supporting material by December 15, 2018, also the scholarship deadline. Regular decision is February 1, 2019. Utah Honors: Priority deadline November 1, 2018; final deadline February 1, 2019. UT Austin Plan II: May apply beginning August 1, 2018; recommended deadline is November 1, 2018, but final deadline is December 1, 2018. Applications are reviewed in the order in which they are accepted. UT San Antonio Honors: November 1, 2018, through February 1, 2019. Vermont Honors: Early action November 1, 2018; regular deadline January 15, 2019. No separate honors application. Virginia Honors Echols: University early action deadline November 1, 2018; regular deadline January 1, 2019. Virginia Commonwealth Honors: Applications to the Honors College from incoming freshmen are accepted through April 15 of the senior year in high school. However, students are encouraged to apply by our priority deadline of February 1. Virginia Tech Honors: University early decision deadline November 1, 2018, with notification December 15; early action deadline December 1, 2018, with notification February 22, 2019; regular deadline is January 15, 2019, and notification by March 5, 2019. Washington Honors: November 15, 2018. 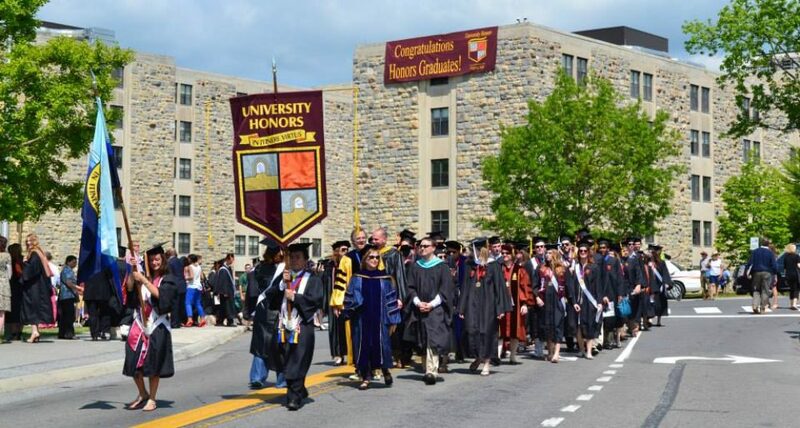 Notification of university admission March 1–March 15, 2019; notification of honors admission March 19–April 13, 2019. Washington State Honors: January 31, 2019. Wisconsin Honors: Early action deadline is November 1, 2018, with notification at end of January 2019; regular decision deadline is February 1, 2019, with notification end of March 2019. This entry was posted in Honors News and tagged college deadlines, fall 2018 application deadlines, honors application deadlines fall 2018 by Honorsadmin. Bookmark the permalink.